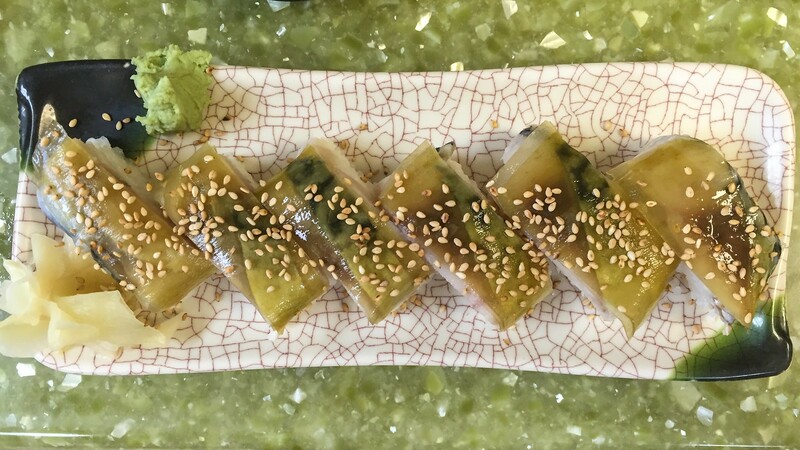 Many, many years ago, when I first started writing this blog, I made a big mistake: I wrote about Sushi Deli. It's not that my recommendation was off target. The once-tiny sushi counter inside a Japanese market (called, simply enough, "Japanese Market") was the classic hidden gem, a place where, among the packaged ramen noodles and bags of rice and frozen fish and togarashi spice mixes, you could get ridiculously good sushi, some of it flown in from Japan every week, at an incredibly reasonable price. There is surely no place I'd visited more often, or that had been the source of more satisfying meals, despite the peculiar hours (closed Mondays and Tuesdays, and never open later than 6:30 p.m. – a closing time which moved progressively earlier over the years as the place became ever more popular). Truth is, a good portion of what I know and love about sushi, I learned sitting at that counter: the joy of the many different varieties of hikari mono, or silver-skinned fish, the differences in flavor and texture among uni from different parts of the world, the seasonality of sushi offerings and the sense of paying attention to what is best when. But perhaps most of all, I learned the importance of trust and loyalty. I don't claim to be particularly close to Chef Kushi: our brief conversations across the counter would mostly be limited to what was good that day, or his last trip home to Japan, or how his golf game was doing, or – most frequently – how he was working too hard. But he knew how much I appreciated his food, and his passion; and I always felt appreciated there too. From what I can gather, the root word of "omakase" is "entrust." After several visits, I entrusted my meals to Michio, and more important, he trusted me enough to let me experience many things I might never have tasted in Miami otherwise. You could go full omakase at Sushi Deli if you wished, which would often bring a procession of sashimi and other items. But my standard order was something of a variation on the theme: I would ask for six pieces of nigiri – whatever Chef Kushi chose – along with a battera roll, an Osaka-style pressed sushi roll topped with vinegar-cured saba, a sheet of cured seaweed, and toasted sesame seeds, plus, usually, a "triple-egg" temaki (uni, ikura, and quail egg) for "dessert." And this was how I discovered any number of things: sayori (halfbeak, or needlefish), with a shiny strip of silver along its gorgeous translucent flesh, tai (Japanese snapper) lightly cured in kombu to enhance its flavor, kazunoko (herring roe), a new years' tradition. Often, these came adorned: grated fresh ginger, a daub of uni, a smidgen of yuzu kosho, a sprinkle of sesame seeds, a dot of miso or ume paste, a sheet of cured seaweed, a sliver of shiso. (You can see several of these in this Sushi Deli / Japanese Market flickr set). Though Michio is, in his way, very much old fashioned – I've tried, unsuccessfully, to count the dozens of signs posted around the restaurant warning customers not to use cellphones and not to take pictures, among other rules – these creative elaborations show that he actually was not particularly bound by tradition. So, too, does the fact that he had women working behind the sushi bar – including his daughter Erika, who, it's reported, is looking to open her own place in the neighborhood within the next year. My mistake was that some things are perhaps better left unsaid. Not that I claim credit for blowing it up on the blog. FFT has never exactly raked in the page views, and I could probably name every person who visited the site in those first few months when I first wrote about Sushi Deli. And many folks with exponentially bigger megaphones than myself have been guilty of breaking what some of us eventually tried to make the "First Rule of Sushi Deli" (You do not talk about Sushi Deli), like chefs Michelle Bernstein, José Andrés, Norman Van Aken, and Kevin Cory of Naoe. But that post is also among the top 25 in all-time visits here, many of those over the past few years, so I guess I'm guilty too. As Sushi Deli became more and more popular the past couple years, I unfortunately found myself going less and less often (of course, considering there was a stretch that I made almost weekly visits, that was bound to happen). What had once been a place where we would just pop in on Sunday afternoons had become one where you had to show up a half-hour before they opened to get on the list for seats. When I was able to score a seat, Michio – who is now a very spry 68 years old – would be in non-stop motion, and often seemed as harried as a Tokyo salaryman. 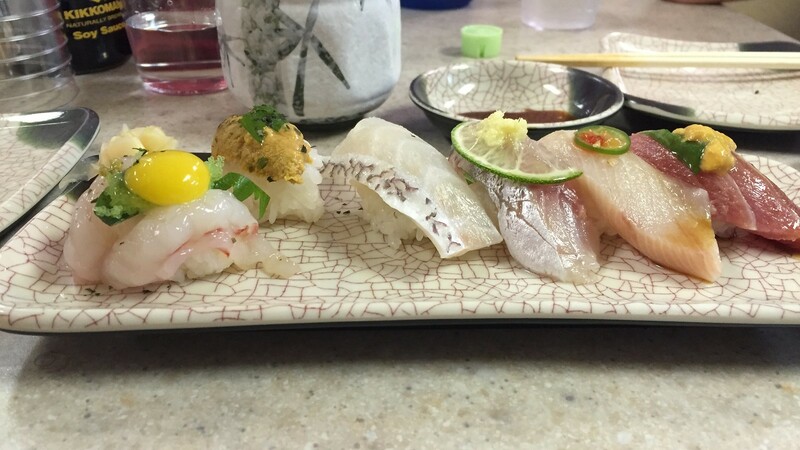 Maybe, Sushi Deli should have stayed a bit more under the radar. Selfishly, anyway, it would have been better for me. Chef Kushi himself always seemed ambivalent at best about Sushi Deli's increasing popularity. In fact, he often seemed to actively resist it. Those shortened hours, and all those rules, seemed at least partially designed to discourage customers – or certain types of customers, anyway. In a story last month which announced the impending closure, he admitted, "I wish I could choose the customers. Each of them." And this isn't the first time he thought about calling it quits. A few years ago, he started a rumor that he was about to close – which may have been serious, or may have just been a ploy to try to get the restaurant listing off of Yelp. But this time, it's for real. 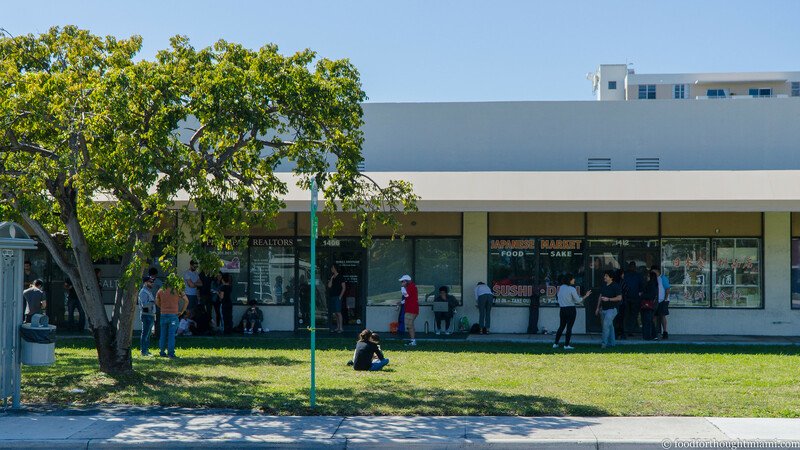 All the merchandise had been cleared off the shelves, and the several dozen folks who were lined up outside yesterday – some as early as 8:30 a.m. – will be Sushi Deli's last customers. I will miss it dearly. I can't even begin to count the moments of quiet happiness I've had at that counter over the years, many of them shared with my family. But I am thrilled for Chef Kushi and his lovely wife to finally get to relax, as they so rightfully deserve. And I am incredibly excited for what's in store from the next generation ... but maybe I shouldn't say any more about that. Not that it ever got very big: over the years, they perhaps doubled the original capacity of about a dozen, if you counted a small table in the back underneath the Japanese video DVDs. It's entirely possible there's also no place where our kids ate more frequently than Sushi Deli, as we've been taking them from a very young age. Frod Jr.'s regular order at first was the salmon teriyaki lunch plate, and he eventually branched out to the rest of the menu. Little Miss F's regular order was the crunchy shrimp roll, though she came to like the battera roll nearly as much as her dad. On my last visit to Sushi Deli a couple weeks ago, another customer saw this coming out and asked Chef Kushi what it was. He opened his eyes wide and exclaimed "I don't know!" It is customary if you're drinking sake at the sushi bar to offer your itamae a pour, but a few years ago, Mrs. Kushi cut Michio off because the sake would slow him down too much in the afternoons. I was always baffled by the people who would wait an hour for a spot there, and then order a California roll and a spicy tuna roll. But maybe even worse were the ponderous blowhards loudly "educating" their companions about Japanese food, usually while drowning Chef Kushi's sushi in a viscous slurry of soy sauce and wasabi.